Acclaimed film curators from both sides of the country will meet at the University of Colorado at Boulder to help celebrate the Fifth Annual Stan Brakhage Symposium on March 14-15. Steve Seid, video curator at the Pacific Film Archive at the University of California, Berkeley, and Mark McElhatten, New York City curator and archivist for Academy Award-winning director Martin Scorsese, will present programs intended to "shed light on the contemporary world of avant-garde filmmaking and artistry, focusing on the exploration of moving visual art, past, present and future." The two-day event is sponsored by the CU-Boulder Film Studies Program and will be held in the ATLAS building on the Boulder campus. Each day will feature short films, presentations and panels that will examine the contemporary avant-garde world. All events are free and open to the public. The symposium began in 2005 to recognize, honor and carry on the legacy of the late Stan Brakhage, who is credited by many visual artists as a man who once all but defined the American avant-garde film movement. Brakhage taught at CU-Boulder from 1981 until his death in 2003 and held the title of distinguished professor of film studies. Brakhage began his filmmaking career in 1952 and completed more than 350 films, ranging from the psychodramatic works of the early 1950s to autobiographical lyrics, mythological epics, "documents" and metaphorical film "poems." Each year the symposium brings members of the experimental film and video community together to celebrate art, to share ideas and to promote the evolution of the moving image. The symposium was made possible by grants from The William H. Donner Foundation and the Academy of Motion Picture Arts and Sciences. For a complete schedule of events visit the Films Studies Program's Web site at www.colorado.edu/FilmStudies/brakhage/symposium_5.htm. Unedited Material from the Star, Talk Mr Bard, Speak, Britannica, Erth and more. The influence of John Latham (1921-2006), an artist whose work includes painting, performance and film to mention just a few, has extended far beyond the boundaries of the art world. Interested in theoretical physics, Latham developed an opposing cosmology which rejected the primacy of space and matter and favour of time and event. The body of work and concepts which developed out of this way of thinking continue to challenge the way we conceive of art as event and of the place of the artist within society. This month’s film programme pays homage to Discrepant Cinema, the bold manifesto by one of the most radical filmmakers in film’s history: Jean-Isidore Isou. According to Isou, one must divide to conquer. 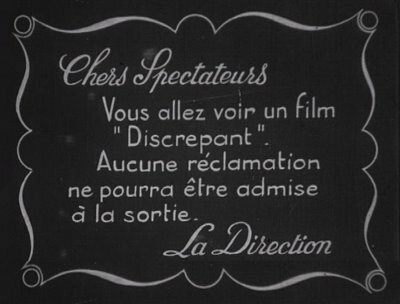 This applies to the two wings of cinema: sound (speech) and image, which he wanted by all means to sever: “I want to separate the ear from its movie master: the eye.” Isou advocated for a cinema in which the images, in their photographic and representative obsolescence, must rot, giving way to the breakage of the spontaneous association that made speech the correspondent of vision. “Who ever said that cinema, whose meaning is motion, has to be the motion of images and not the motion of words?” Isou proclaimed. - A series of programmes at the BFI Southbank: Early Jeff Keen Films (17 Feb., 20:40), Dr G's Home Movies (19 Feb., 20:40), Joy Thru Film (25 Feb., 20:40) and Artwar (27 Feb., 18:20). 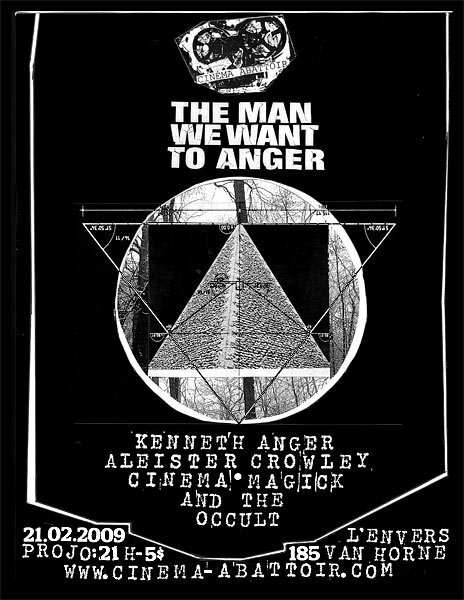 - A UK tour of a selection of Keen's films. So far only the Electric Palace at Hastings (18 March), Arnolfini at Bristol (27 March) and the Belfast Film Festival (29 March) have been confirmed. You can follw up all the activities in the webpage specially built for the occasion by the BFI. In November 2007 the Office for Contemporary Art Norway held a three-day seminar in Oslo that brought together artists, critics and theorists to articulate or respond to the ways in which we might understand film to be a critical practice. It was accompanied by a film programme curated by Ian White. Six Tuesdays After Film as a Critical Practice is a series of ‘talks’ that further explores the same proposition from international and intergenerational perspectives and extends the idea of ‘critical practice’ to incorporate the structure of the event itself. It includes a continued enquiry into the work of three artists whose films and videos were also shown in Oslo: Emily Wardill interviews Peter Gidal and Emily Roysdon presents a specially conceived performative work. Rosa Barba’s two-projector scultpure/sound work Western Round Table 2027 is shown alongside a selection of original recordings from the 1949 Western Round Table on Modern Art featuring contributions from Marcel Duchamp, Frank Lloyd Wright and Arnold Schoenburg. There is an interactive presentation of the German television programme Reformzirkus (1970) in which the celebrated German filmmaker, writer and thinker Alexander Kluge intervenes to expose not only the construction of the programme itself but also cultural and social prejudice and radical, revolutionary ideas about the function of the medium that assault the established order. Artist Cerith Wyn Evans makes a special live event and the series begins with writer and academic Tom Holert’s presentation of his recent video Ricostruzione: Dissertori/Libera (Towards a Historical Fable about Modernist Architecture and Psychology) (2007, co-authored with Claudia Honecke, commissioned by Manifesta 7). He discusses the relation between the critical practices of writing and art making, or working as a critic and as an artist making critical video, the coexistence and the navigation of these things.